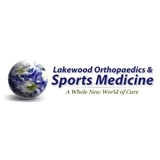 Lakewood Orthopaedics & Sports Medicine (Rockwall) - Book Appointment Online! Founded in 2005 by Dr. Terry Gemas, Lakewood Orthopaedics & Sports Medicine has helped treat patients with orthopedic conditions including sports and work related injuries, as well as arthritic joint conditions. Their mission is to offer the highest level of expertise and the most up-to-date technology to provide patients with the best care possible. Committed to excellence, the team at Lakewood Orthopaedics & Sports Medicine strives to make patients’ visits as smooth and comfortable as possible.